The EasySolar combines an untra-fast MPPT solar charge controller, an inverter/charger and AC distribution in one enclosure. The product is easy to install, with a minimum of wiring. Up to three strings of PV panels can be connected to three sets of MC4 connectors. AC distribution consists of an residual-current device and four AC outputs protected by circuit breakers. One output is controlled by the AC input and switches only when AC is available. An additional fuse box is no longer needed. 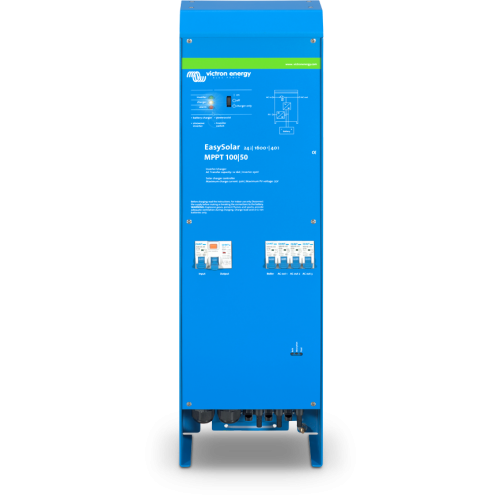 EasySolar also combines the familiar Victron PowerAssist technology; protecting the utility or generator supply from being overloaded, by adding extra inverter power when needed.